Do you know why we celebrate Labor Day? Labor Day is a federal holiday in the USA and has been since June 28, 1894 when congress passed an act making the first Monday in September a national holiday. The purpose of Labor Day is to honor laborers of all kinds and the “workingman” and now working woman and their achievements. Yes, this also includes orthodontists and orthodontic team members at Honig Orthodontics. The labor movement started in the late 1800s during the height of the Industrial Revolution in the United States. Believe it or not, during that period the average American worker worked 12 hours per day 7 days per week just to make enough on which to live! Although there were some restrictions in some states, it is hard to imagine children as young as 5 or 6 years old could be found working in factories around the country to help feed themselves and their families. Times were tough! The children were paid a small fraction compared to adults and often in working conditions that were hazardous and completely unsafe without sufficient bathrooms, fresh air, or work breaks. Because of these working conditions, labor unions were started to demand better conditions. Organized strikes began to occur to protest the working conditions and poor pay scale. Many of these strikes turned violent. A good example of this is the Haymarket Riot of 1886 in Chicago where many people including police officers were killed. Then on September 5, 1882, 10,000 workers took unpaid time off to march from City Hall to Union Square in New York City, holding the first Labor Day parade in U.S. history. 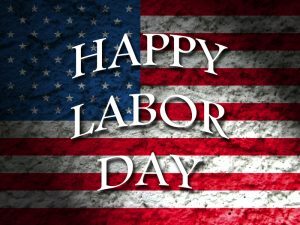 Although it is not evident who should be credited with founding Labor Day, some credit Peter J. McGuire, cofounder of the American Federation of Labor, while others have suggested that Matthew Maguire, a secretary of the Central Labor Union, first proposed the holiday. Now you know why Labor Day is still celebrated in cities and towns across the United States with parades, picnics, barbecues, fireworks displays and other public gatherings. For many Americans, particularly children and young adults, it represents the end of the summer and back-to-school. But it really represents something much more… A celebration of how far we have come in the past 120 years. All of us here at Honig Orthodontics in Middletown and Newark DE hope you had a great summer and wish you a safe and enjoyable Labor Day.